Those tourneys on Carbon I mentioned last Friday both turned out well for me. Both had $5 entries, but I’d won free entries by answering questions posted by the @CarbonPoker account over on Twitter. The “Fat Stack” tourney featured starting stacks of 1 million chips (with 25,000/50,000 blinds to begin) and 10-minute levels. A total of 50 entered, which I liked because Carbon has a kind of odd payout schedule whereby only the top five spots cash if 30-49 players play, but the top 10 make the money if 50-99 play. Thus with exactly 50 registered, that meant 20% of us would cash. While I certainly wanted to win, even a small cash would be fine by me, helping me start a tiny bankroll. As it happened, I did make it all of the way to a seventh-place finish, at which point my pocket aces were cruelly cracked by a player holding 6-6. Good for $12.50, that. I chipped up early in that one and was sitting on 30-35 big blinds for much of the time, so there was some play pretty much until the very end. By contrast, the other one, the “Slim Stack” one, was just about entirely chance-based, essentially an “all-in-or-fold” tournament in which we began with 10 chips and 0.5/1 blinds, then saw increases every two minutes. Only 15 entered that one, which meant only the top three spots paid. Again, though, we were looking at 20% of the field cashing. On the third hand I shoved with A-8, got called by A-J, and spiked an eight. Tripled up soon after that with A-Q (I believe), then survived to finish third and score another $15. In other words, I made more in the crapshoot than in the one requiring some genuine decision-making. 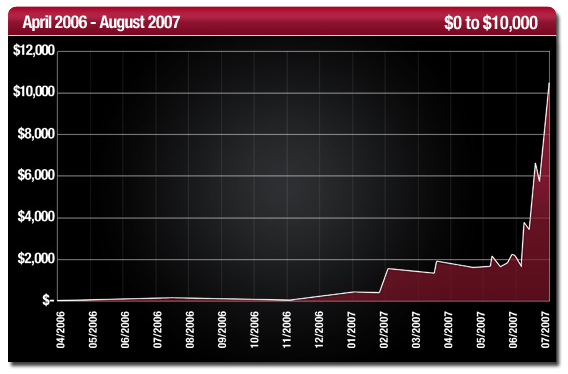 I mentioned Friday how I had a penny in my account there before, so that makes my total roll on Carbon $27.51. Once again, then, I get to contemplate how best to turn a little into a little more. 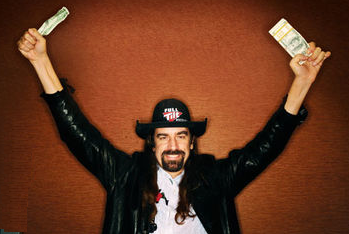 For those of us who were playing online poker several years ago, this whole “zero to hero” scenario automatically recalls “The Chris Ferguson Challenge” in which the pro succeeded in building a bankroll of $10,000 from nothing, starting his journey by winning a pittance in a freeroll, then practicing sound bankroll management from there. Ferguson’s rules included never buying into a cash game or sit-n-go with more than 5% of your total bankroll, never buying into a multi-table tourney with more than 2% of your total, and leaving a cash game if you ever worked the money on the table up to more than 10% of your total worth. He allowed exceptions for the micro limits. You could buy into any cash game or SNG for $2.50 or less, or any MTT for $1 or less, regardless of your roll. I think he may have busted at least once and had to start over, but eventually he did reach the goal, then donated the $10,000 to a charity. That whole story reads much differently today, of course, thanks to the “Black Friday” indictment and civil complaint that targeted (among others) Full Tilt Poker, with the civil complaint later amended to include Ferguson among those being accused of various wrongdoing. The amended complaint (made public in September) alleges that “Defendant Ferguson” was the Chairman of the Board of Directors of Tiltware LLC as well as a part-owner of the company, and that he was among those who were paid large sums out of player funds, thereby helping create a situation in which Full Tilt owed players something like $390 million worldwide while having less than $60 million on hand (in late March 2011). Shortly after the amended complaint dropped in September, Ferguson’s lawyer, the excellently-named Ian Imrich, responded by refuting the whole “Ponzi scheme” characterization made by U.S. attorney Preet Bharara. A couple of days after issuing the amended civil complaint, the DOJ moved to seize funds from FTP board members’ accounts, including Ferguson’s. A week later Ray Bitar filed a claim against those seizures, and a couple of weeks after that (in mid-November) Ferguson likewise filed a few motions with the Southern District of New York, including some against seizures of funds from his accounts. One of those motions lists a couple of different FTP companies (the Kolyma Corporation and Vantage Ltd.) having the rights to $98,276,540 in several accounts seized by the DOJ. Another speaks of Tiltware, and that one Ferguson claims his right to $196,553,080 worth of funds in several different accounts. The argument -- if I am following it correctly -- is that some of the funds in those seized accounts were “in the process of being returned to Full Tilt Poker players” (to quote from one of the motions). Indeed, I’ve thought since I first heard of those “FTP Insider Accounts” that the moving of big sums into the owners’ personal accounts probably wasn’t unrelated to an effort to keep the money squirreled away somehow and not necessarily evidence that the owners were simply taking the money for themselves. Then again, I think some of that was probably going on... who knows, really? Of course, the status of all of this has likely changed with the apparent deal between Groupe Bernard Tapie and FTP (“brokered” by the DOJ) to effect the sale of the company to the French group as well as the return of funds to players, including funds seized by the DOJ. A curious contrast, isn’t it, between Ferguson's careful management of money in his “Challenge” and his apparently less-than-cautious handling of things at Full Tilt Poker? In any case, I'll consider Ferguson's bankroll advice as I try to manage my little roll on Carbon, realizing as I do that it’s hard to refer to something called “The Chris Ferguson Challenge” anymore without recognizing all of the new possible meanings the phrase evokes.